Dinner parties offer a great way to entertain friends in your home. A lot of people get stressed by the idea of dinner parties because of the detailed planning that is typically involved. In addition, hosts and hostesses usually try to impress people with their cooking. Hosting a dinner party doesn't have to be stressful; here are some tips to help you out. You should choose a theme based on food you are comfortable cooking. If you've never made Ethiopian food before, that genre is probably not the best place to start for your first dinner party. If you do want to try a few new dishes, plan on a trial run a couple of weeks before the party to see if this is the food you really want to serve. People often think they have to serve fancy food at a dinner party, but it's a much better idea to go with food you know will turn out great, which usually means simple, delicious things that you have made before. Think about the foods you make for guests or family that are consistently complimented. Those are the kinds of things you should be serving at dinner parties. Another key to hosting successful dinner parties is creating a guest list of people whom you believe will mix and mingle well together. Do this by figuring out the right number of guests and the right mix of personalities. Number of guests: Unless you have a lot of practice entertaining, you probably don't want to host more than six or eight people. The number of people you can comfortably entertain depends on the size of your home, particularly your dining room table. Dinner parties are meant to be intimate and cozy, but if your place is so small that everyone can't sit at the same table, that's a problem. Fun couples: A great way to start hosting dinner parties is to invite over a few of your favorite couples for a meal. Don't call it a dinner party if that seems like too much pressure. Just have some people over for dinner. As you build your confidence, you can invite more people and have fancier parties. A big question that a lot of people have when planning dinner parties is how much food and how many courses should be served. The amount of food will depend on the number of guests and exactly what you are serving. If you're having burgers steaks, or fish, for instance, one burger or three to six ounces of meat or fish are fine for a main course. If you're cooking an ethnic meal, you might want a couple of different "main" dishes for people to try, such as a lasagna and a pasta dish. For a pizza party, plan on serving two or three different kinds of pizza. While just a main dish and a simple salad or vegetable might be enough when cooking dinner for your family, for a dinner party you'll want to be a little fancier and make a little more food. Greet your guests with an appetizer or two related to your theme, and maybe a special cocktail or glass of wine that complements the first course. With your main course, include a salad and a side dish or vegetable and bread if necessary. Include a simple dessert that you can make in advance and feel comfortable serving in your living room, and you'll be ready to go. The following chart will give you a good idea of average serving sizes for the most common foods. Keep in mind that you can adjust portions sizes up or down slightly depending on how many courses you plan to serve. As a general rule of thumb, you'd rather have a little too much food than too little and risk running out before your guests are satisfied. Once you're familiar with these simple guidelines, you can also gage portion sizes for similar foods that are not on the list. Even though the meal is the main focus of the dinner party, it's important to think about those other finishing details. Decorating for a dinner party isn't really necessary, but if you've got a theme that you would like to reinforce through decorations, go ahead. 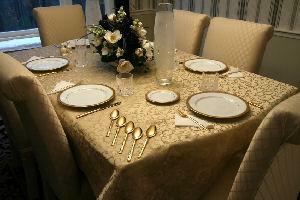 The color and pattern of your tablecloth and other linens can also suggest your theme. Whether or not you decide to decorate your entire dining area, at least your table should look attractive and inviting. Make sure that any centerpiece you use is low enough that it won't inhibit conversation across the table. Music is important for a dinner party, especially if you plan to have some downtime between courses. The theme can dictate your music, or you can go with some cool jazz or other happy, quiet music that can be kept on in the background throughout the meal. Remember to be a good host; take your guests' coats and offer them drinks first thing. Give them appetizers and introduce anyone who might not know everyone at the party. Remember that being a good host may begin before the dinner party itself. If you are planning to invite friends with special dietary needs, make sure you get details about what they can and can't eat before you plan your menu. You don't have to make everyone's meal identical, but you should make the effort to provide something nice for the person who needs something special. Anticipating your guests' needs and planning a great menu are two key factors in creating a successful dinner party your guests will enjoy.